Judy Baca’s Iconic Olympic Mural on the 110 Freeway Nearly Erased by Graffiti Paint-Over ProgramNovember 4, 2013, Venice, CA One of LA’s 1984 landmark Olympic murals, “Hitting the Wall” by iconic muralist Judy Baca has been nearly destroyed; the entire bottom half of the mural was ‘grayed-out’, apparently in mid-October. Not the work of taggers this time but by an anonymous freeway graffiti paint-over program. As of last week, CalTrans denies any responsibility for the washing out of the mural. Regardless of who’s responsible for the latest destruction, the battle for LA’s murals continues. 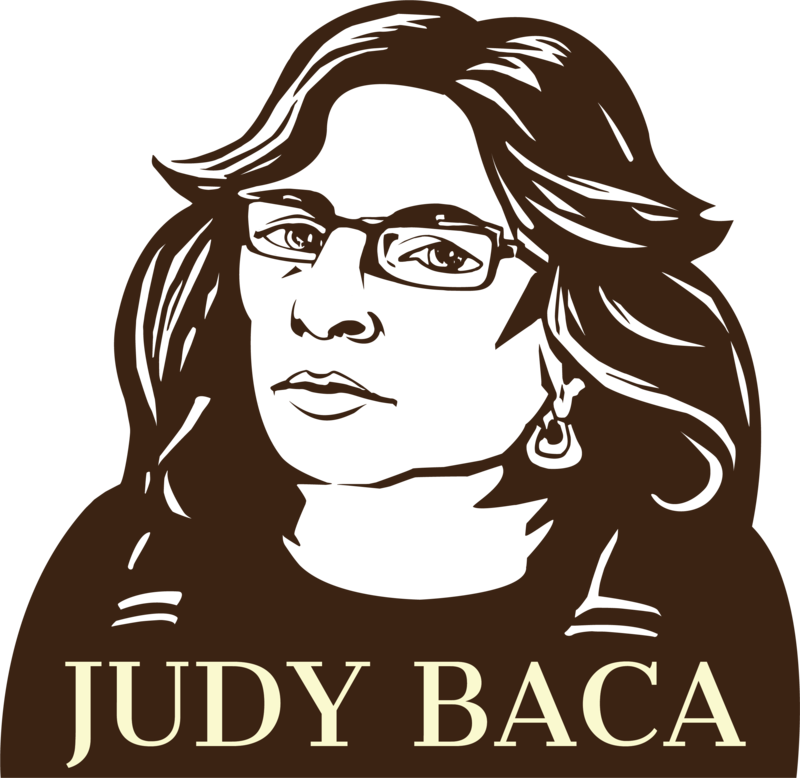 Artist Judy Baca’s VARA Rights have been violated since she did not receive the legally mandatory 90-day notice of CalTrans intention to cover up the mural and, as Baca states, “legal action will be taken to secure the longevity of the fine art work.” The Visual Artist Rights Act (VARA) is a federal law that protects an artist’s moral rights including any intentional distortion, mutilation or modification of a work that would compromise [their] reputation. The current CalTrans policy requires ‘freeway artists’ to maintain their own murals, regardless if the art works were created in the interest of the public. Beginning in 2007, LA’s freeway murals were painted over by CalTrans to ‘protect’ them in ‘hibernation’ (under grey paint) until funding was available for restoration. 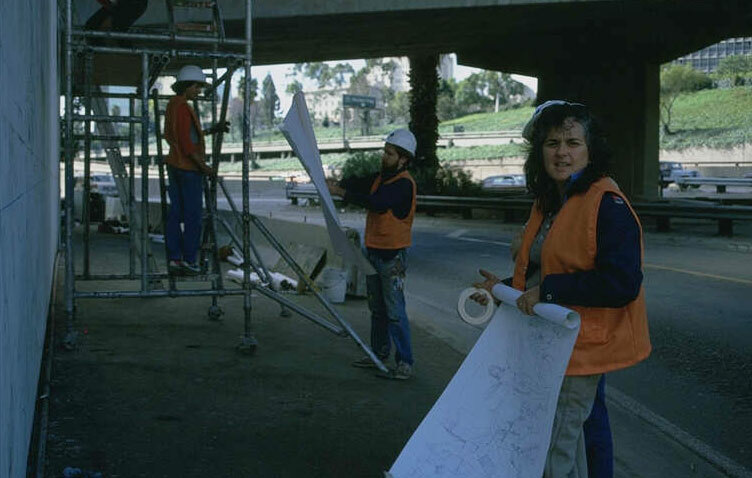 For now, CalTrans attempts to be artist friendly by offering to support restorations with safety procedures, however, artists like Judy Baca remain financially responsible for the cleaning of their murals. Hitting The Wall Restoration has been undertaken as the mural was damaged with graffiti. In recent months there has been a proliferation of tagging on murals throughout City of Los Angeles freeways. This has resulted in the whitewashing of several murals by Cal Trans. 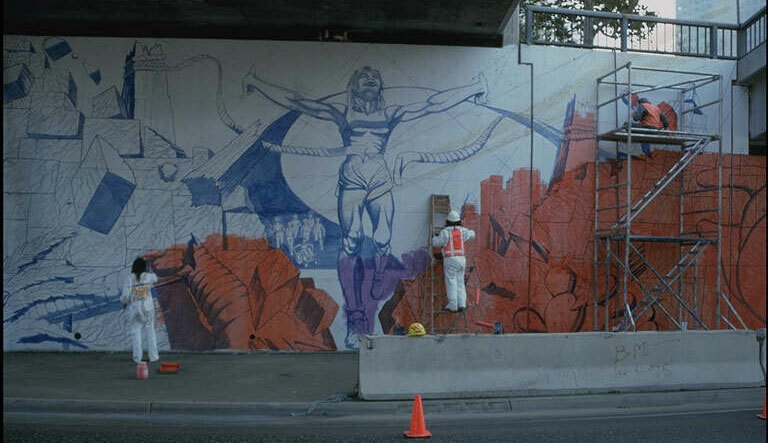 Judy Baca’s 1984 Olympics mural, Hitting the Wall, which commemorates female marathon runners, is one of the latest freeway murals that is caught between Graffiti artists and Cal Trans paint overs. The repeated tagging on this mural has made it a target for Cal Trans whitewashing. Hitting the Wall, an 18’ x 90’ mural that has been a part of the Third Street exit on the Harbor 110 North Freeway since 1984, is now at risk. If you have driven north on the 110 Harbor Freeway by the 3rd Street Exit to Downtown L.A. recently, you may have noticed the transformation of Judy Baca’s 1984 Olympics mural, “Hitting the Wall: Women and the Marathon.” After 20 years graffiti free, this downtown landmark, commemorating women marathon runners first time run in the International Olympic Games in 1984 was nearly destroyed by vandals. The 25ft x 100ft mural at the Music Center’s exit had been badly tagged over the last two years leaving the bottom ten feet totally obscured with graffiti. Age and Los Angeles car emissions had also taken a toll on the paint film. 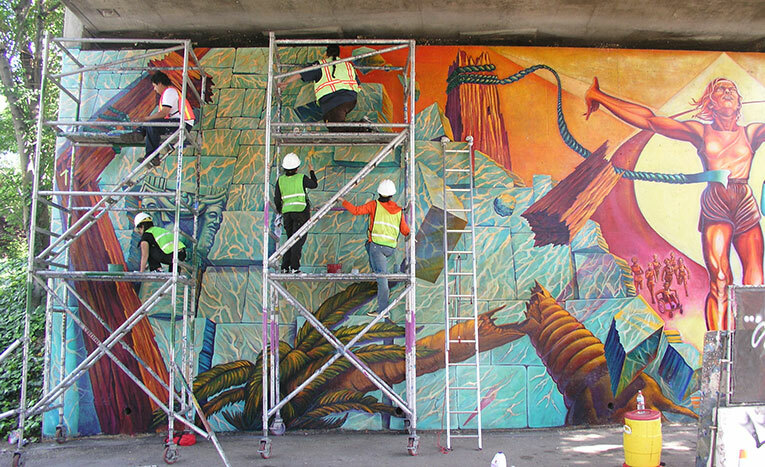 Due to a Cal Trans policy that required artists to maintain their own murals on public freeway sites, graffiti was cleaned from neighboring walls by Cal Trans workers and allowed to remain on the mural. This policy actually shifted the favorite graffiti sites of taggers from blank walls to the murals. Tagging a mural meant that the tag would remain until the artist could remove it guaranteeing the tagger a longer time of visibility. 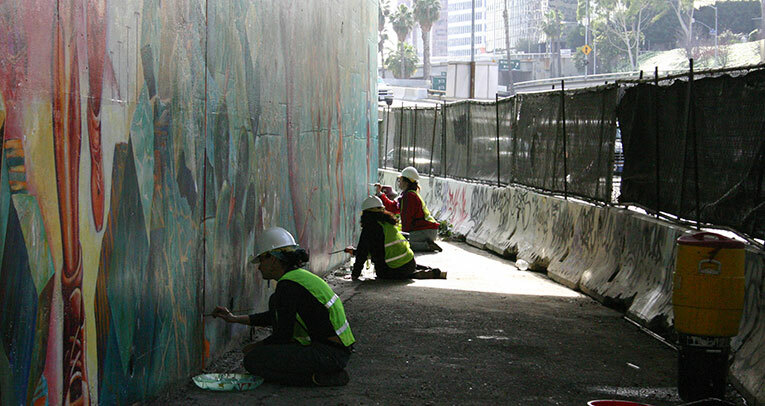 Artists were given 60 days by Cal Trans to remove the graffiti or lose the mural. Cal trans painted over a number of important freeway murals when the artist was unable to remove the graffiti resulting in taggers perceiving themselves as powerful destroyers of murals. Shortly after the policy was put into affect, attacks on the murals began full scale by taggers who targeted the murals with a vengeance. Hitting the Wall was threatened with whitewashing as part of a Cal Trans program of graffiti paint-overs as was many others. Strong advocacy by many people resulted in a change of policy and Cal Trans allotted the funding for the restorations sponsored by the Cultural Affairs department of the City of Los Angeles with Cal Trans funds. Recently restored also was Alonzo Davis’ Olympic mural across from Hitting the Wall. Others are also in the works. The mural was restored by the conservationist Nathan Zakheim and Associates, and an artist team led by Judy Baca, and fellow muralists Martha Ramirez, Raul Gonzales and Nuke. For many years SPARC who began the first Mural Maintenance and Inventory Program in Los Angeles, quietly maintained many of the murals in Los Angeles including many of the freeway murals. Due to SPARC’s loss of city funding the city has lost an important advocate for the murals of Los Angeles and it is certain that many more murals will be lost in the coming period as SPARC no longer has the capacity to do this important work or the advocacy for the retention of the murals it produced. We hear rumors that the city of Los Angeles has notified the first SPARC’S Neighborhood Pride artist of a new “remove it or lose it” graffiti policy. SPARC sponsored over 105 murals through this program which are now in jeopardy should this policy go forward unchallenged. It is a sad day in what was once the mural capital of the country. Watch for more on this topic from SPARC. Funding for the restoration of Hitting the Wall was provided by Cal Trans and administered by the City of Los Angeles Cultural Affairs Department.